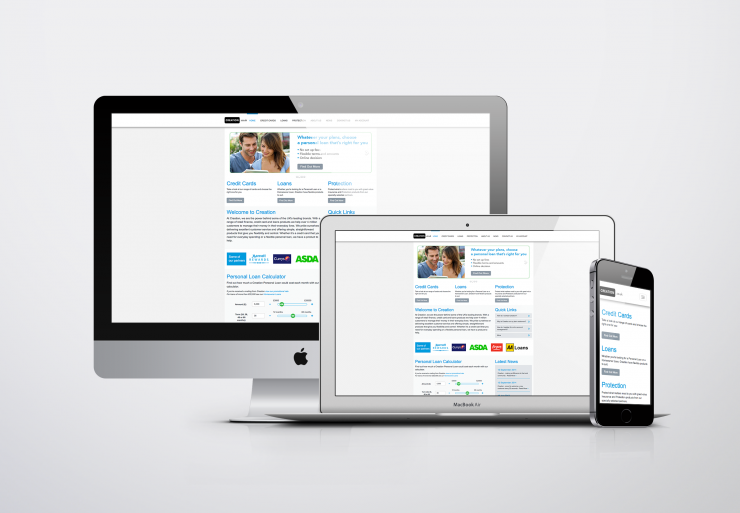 We have recently completed a “responsive refresh” of the creation.co.uk website for LaSer UK. The brief was to create a website which has a clear and simple layout. Most of all it had to be is easy for customers to navigate. LaSer UK is a leading provider of affinity credit cards, retail finance and loyalty solutions through its consumer brand Creation. Customers access these solutions through the Creation Website, creation.co.uk. They manage 4 million customers on behalf of over 200 organisations. LaSer finances £1.4 billion in customer balances and employ over 740 people across two sites in the UK. Their customer facing website is creation.co.uk. Hence the website is the main point of access for customers to apply for loans and credit cards, view balances and pay bills. The website is dynamic and mobile responsive. The creation website can be accessed easily on any device, whether, computer, tablet or phone. The Creation website lets customers access all the information they need before applying for loans, credit cards and making payments. Furthermore the team at LaSer wanted to be able to update information within the webpages quickly and easily. So with this in mind we built the website using our content management system Emperor Cms. The CMS is easy to use and the Creation team can make quick updates. Hence the team at LaSer have more control over their website and do not need to rely on us to change information. In conclusion, the staff at LaSer were really pleased with the responsive refresh. “Haywyre is happy to do everything we need – small jobs are dealt with quickly and efficiently and larger pieces of work are project managed deftly and seen through, stage by stage, to their close.” Gemma, Creation.